Shout out to The Penny Hoarder for telling me about the easiest way to save money on electricity with OhmConnect! Actually, on top of saving money on my electricity bill, I’m actually EARNING money 1-2 days a week with OhmConnect. OhmConnect is a start-up company that pays you for using less electricity during high demand times when a lot of electricity is being used throughout your city. When the electricity use is in higher demand than what the electric company can normally generate, they need to get the extra electricity from backup power sources such as coal. 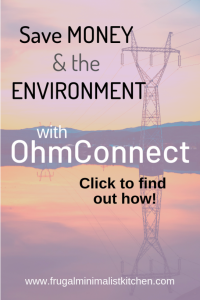 OhmConnect works with your electricity company to try to eliminate their need to use dirty energy sources. If we can collectively reduce our usage during these peak times, the electricity companies can meet the electricity needs from their normal source and therefore don’t need to get electricity from highly polluting coal plants. You can read their FAQ here. With OhmConnect you earn points based on how much less electricity you used compared to your usual usage for that time. You usually participate for about one hour per week, what they call an OhmHour. The price of electricity (price per kwh) during the OhmHour also affects what you earn. Since OhmHours usually occur during peak times, you will be saving money by reducing your electricity use when your power company is charging more! If you’re passionate about saving electricity, read more tips in my article about ways to save electricity in the kitchen. You get a message from OhmConnect asking you to reduce your electricity use during a certain time period, usually for just one hour. This is called an OhmHour. If you use less than what you normally use during that time, they pay you. Yep. It’s literally that simple! Additionally, you earn an extra 5% more for every time in a row you beat your forecasted use. This is a streak. They also have different “levels”. Basically, the more times you participate and beat your forecasted use, the more you will earn. When you reach gold status, you earn 1.5x more points, and at platinum status you earn 2x points compared to the beginner silver status. At first I wasn’t earning much and was feeling a bit discouraged. I knew that the more I participated and saved, the more my earning potential would increase, so I stuck with it. Lately I’ve been earning over $1.50 for each OhmHour being at the Gold level with a streak of 6 successful OhmHours in a row. Update: Now that I’ve reached Platinum level with a streak of 21 OhmHours in a row I’ve been earning nearly $5.00 per OhmHour! 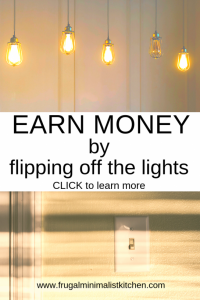 Before you click away because a few dollars per hour doesn’t seem like much, wouldn’t you like to earn money while going grocery shopping or having a candlelit dinner? I promise to update the post as my earnings grow, but I wanted to write this post with my beginning numbers (2 months in) so that you know the reality of it, rather than being disappointed if you’re not seeing the same numbers. The best part about OhmConnect is not only that you’re saving on your electricity bill by reducing usage during a peak time (higher priced electricity), you’re earning money AND you’re helping the environment. Cash payouts are via PayPal. Minimum cash out is only $10 and you earn $10 instantly if you sign up through my link. If you have a smart device and connect it, you can earn an additional $10! To earn money during OhmHours, you have to have an account with a participating electricity provider in California, Texas or Toronto (see the list here) . If you don’t have an account with one of these providers, you can still participate to reduce your electricity use, enter draws and earn $20 for each person you refer. The amount earned won’t replace an hourly wage, although it pays better than most online survey companies! If you already use a very small amount of electricity, it will be more challenging to beat your forecast, but still doable! What electricity companies work with OhmConnect? OhmConnect is currently partnered with Toronto Hydro in Canada. In the US, they work with electric companies in California and Texas. Check here for the most up-to-date information about who OhmConnect partners with. If you are with one of these companies, sign up now and get a $10 sign up bonus! If you aren’t with one of these companies, you can still sign up and earn by referring others! Read more about that below. How does the OhmConnect Referral Program Work? The referral program with OhmConnect is really generous. It helps me earn a lot of money really quickly because they give you $20 for each person you refer! Plus, if someone signs up through your link, they will earn a bonus $10. Sign up to get your $10 bonus now! You can refer people even if you can’t participate in OhmHours with your electricity company. Additionally, you can get a double referral bonus which gives you $40 for each referral who signs up within a 2 week period! If you’re feeling like unplugging everything, then plugging it back in every OhmHour is too much hassle, you could simply take a few minutes to learn the switches on your panel box. Then you can simply flip a few switches before the OhmHour starts and after it ends. You can also completely automate your savings with smart plugs and programmable thermostats. These devices connect to your wifi and will automatically turn off during a scheduled OhmHour, even if you aren’t home! This option does require some investment but you could use your initial OhmHour earnings to invest and then you will barely have to think about all your future OhmHours. OhmConnect will round up the points you earn so you can get a discount on their smart devices. Since you’re using the points earned through OhmConnect, you can basically get these devices for free! Streak points: You earn 5% more points for every OhmHour you beat your forecasted use in. Once you hit a streak of 20, you will be earning double the points! Buddy points: You can partner with a friend or other random user. When you both beat your forecast for an OhmHour, you earn additional points based on the percent you beat your forecast by. For example: if you both beat your forecasted use by 75%, you will each earn a bonus $0.75! Referral bonus & double referral bonus: You can earn $20 (2000 points) for each person you refer to OhmConnect. Just for participating in the OhmConnect program, you can also earn tokens which can be traded in for bonuses such as the double referral bonus. When you trade in your points for the double referral bonus you will earn $40 for every referral who signs up! What do you do during an OhmHour? To participate in an OhmHour, I spend just a couple minutes before and after the OhmHour to turn off and unplug the appliances, and then plug them in again after. Sometimes I even flip the breaker switch to save 100% during the OhmHour! My OhmHour routine is pretty streamlined now and helps me consistently beat my forecasted use. You might have to do more or less based on how big your house is and how many power using appliances you have. I’m hoping you are convinced that using OhmConnect is an amazing way to both earn money AND save money off of your electricity bill at the same time. If so, sign up and get $10 in your PayPal account now! Now you know what an OhmHour is and what OhmConnect is all about! Comment below and let me know how much you’ve earned with OhmConnect or your favourite way to save electricity.